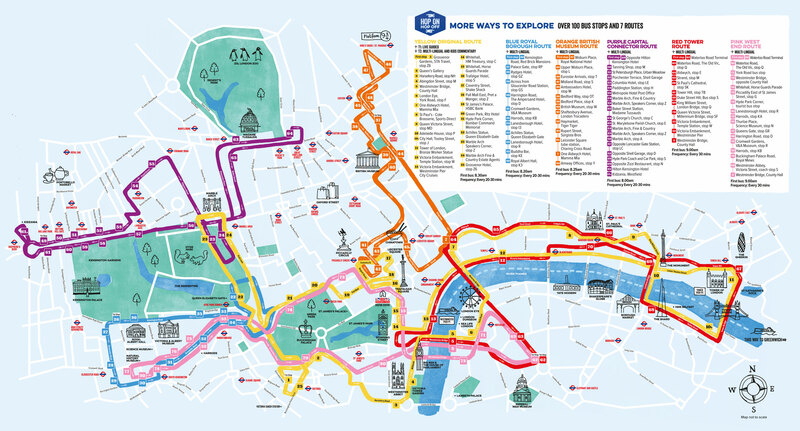 The Original Tour London: Hop-On, Hop-Off Bus Ticket, Cruise & Walks - Extra 24 Hours FREE! FREE walking tours and a hop-on, hop-off Thames Cruise! The ever-popular The Original London Hop-on, Hop-off Tour allows you to see the sites of this wonderful city at your own pace and create your perfect London sightseeing itinerary. Also included in the package is a River Thames hop-on, hop-off cruise between Westminster, Tower Bridge and Greenwich. Plus, get to know the city more intimately with three walking tours – Changing of the Guard, Jack the Ripper Tour, and Rock ‘n’ Roll Walking Tour. With four routes covering popular London attractions, hop on and off at the well-placed bus stops and visit attractions of your choice. The London hop-on, hop-off tour gives you the liberty to customize your own sightseeing itinerary. With a high frequency of buses, you could simply hop off at a stop, spend time at one attraction and then board a bus to reach your next destination. Buses depart between 8:10am and 6:30pm, every 10-20 minutes. Thames Cruises run between 10am and 6pm. Walking tour timings change season to season - ask the friendly on-street staff for the timings. Before boarding the bus, you have to redeem your confirmation voucher at the Original London Visitor Centre (Charing Cross Station) located at 17-19 Cockspur Street Trafalgar Square London SW1Y 5BL. London is a functioning capital city and therefore political events, demonstrations and celebrations can disrupt the route at any time, especially during summer and at weekends. While every effort is made to ensure a smooth and frequent service, there may be delays, reduced frequency and route alternations due to traffic and road closures. Whilst we offer the walk daily, the Guard Change will not take place if it rains. The parade will take place at Buckingham Palace on Monday, Wednesday, Friday and Sunday. On the days when the visit to the Changing of the Guard Parade won't be available, you will be taken to see the Changing of the Horse Guard at Horse Guard Parade followed by a visit to the Buckingham Palace. Your voucher will be valid for three months from the date chosen at the time of booking. Children aged 4 and under travel free and do not need a voucher, therefore you do not need to make a booking for them. It was a really great tour. Trasy dzienne obslugiwane sprawnie, równiez przejazd statkiem. Trasa nocna to jakies nieporozumienie, odjazd z Picadilly z pólgodzinnym opóznieniem o 20.30 normalna dzienna trasa zólta, a w autobusie komentarz wylacznie po angielsku -sluchawki nie dzialaja-. Wieczorem okolo 19 autobusy dojezdzaja tylko do Victoria St.